I seem to be on a blueberry mango kick lately. I just can't resist putting those two fruits together as they are absolutely amazing together! It all started with my amazing Mango Blueberry Muffins with Coconut Streusel, Now I'm hooked, addicted one might say. I need my Mango Blueberry fix. In a large bowl, toss together the fruit, sugar, salt, lemon juice, and cornstarch. Transfer to a 13 by 9-inch dish. Set the oven rack to the middle position. Preheat to 375. In a food processor, whisk together flour, sugar, baking powder, baking soda, and salt. Working quickly so as not to warm the butter, add the butter into the dry ingredients and pulse until the mixture resembles coarse crumbs. Add the buttermilk until it has been absorbed and there are no dry patches. Do not overwork. The dough will be wet. Spoon dollops of biscuit dough on top of the fruit. (The dollops will spread and join with one another as the cobbler cooks.) Brush the dough with buttermilk, and sprinkle with sanding sugar. Bake until the biscuit topping is lightly browned and cooked through, 30 to 35 minutes. Serve warm or at room temperature. I want to eat this right now!!! love the combo of mango and bluberries together! oh gosh, i would love to eat some of this right now! This looks so delicious... mango and blueberry is a wonderful pairing and just the right touch of citrus. Yum! Mango and blueberry are our favorite fruits in our household and always curious to try the muffins. Now it became cobbler! Must be super delicious. I can almost taste from this beautiful photo.... nah I need REAL ONE!!!! Looks great Dee!!! Yes, you see my trend here! I am making those muffins tomorrow. Yum! Thanks for commenting. I wish it wasn't all gone! I am the only one in my family that LOVES blueberries. Crazy as it is, some like sour cherries. I just may give this ago with sour cherries and mango's instead. well see. 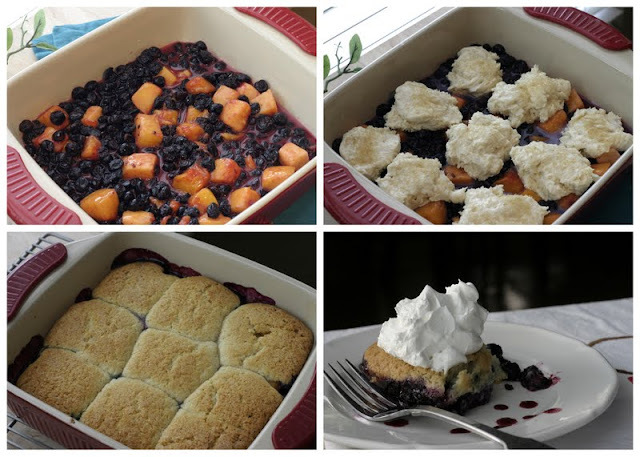 I found you through Sweet as Sugar Cookies, and this cobbler looks awesome! We have definitely been on a blueberry kick at our house this summer too; I can't wait to try this out! The dish looks delicious, I want to try some of that one of these days. www.gourmandia.com and www.gourmetrecipe.com also have attractive recipes that you’ll surely love!